However, they are paid, since it takes a considerable amount of time to do each one. The cost is $20 AUD. I've decided on that price as there are at least 20 pages in each reading, it takes hours out of my day and I add miscellaneous things as in the image above, plus add personal notes/intuition which most people do not include in full readings. DAY of MONTH of YEAR. CITY and COUNTRY of birth. HH:MM am/pm of birth. 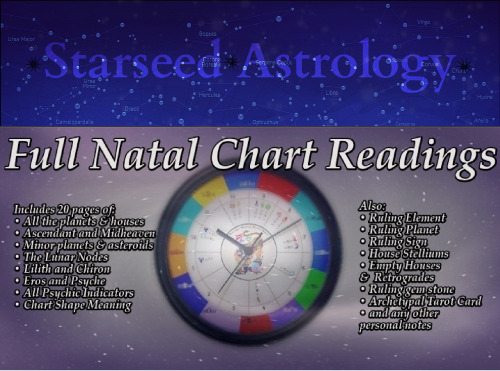 Once your money has come through to my Paypal, I will complete your reading using your birth details and send your reading back through email. If you would like to see a sample chart of what you would be receiving, please email me (same email) and I will send it for free.